Leah Andrascik’s three-year-old son Dmitri is running around their living room in his Pittsburgh Penguins hockey jersey—while she’s trying to talk. She’s sitting on the family’s plush couch, under a decorative mantel above the fireplace. "We like our house. I like big, old houses, so this is perfect for us," she says. What Andrascik and her husband don’t like is living across the Ohio River, less than a thousand yards away, from an industrial coke plant—known for emitting air-polluting chemicals. She says the smells from the Shenango Inc. Coke Works on Neville Island are hard to describe—sometimes like a campfire, other times, sickly sweet. "There was a couple times where went outside and it was so bad it burns your eyes. When I was pregnant with him there was a few times when the odor made me vomit." That’s one reason Andrascik got involved with the community group Allegheny County Clean Air Now. Soon after her son Dmitri was born prematurely, Andrascik went to a health department meeting about air pollution in the area. Officials there talked about health impacts. "One of them was poor birth outcomes," she says. Andrascik wonders if her son was born prematurely because of pollution from the coke plant. She’s since had another son. And she worries about allowing her children to play outdoors because of the smell, and the black dust that covers their plastic swing in the yard. The Allegheny County Health Department is responsible for making sure the coke works meets federal and local air quality standards. Last spring they signed a consent agreement with the owners of Shenango to improve the plant’s pollution issues. The county’s air monitor indicates the air pollution which they track around the plant is within legal limits, but Andrascik and her neighbors say that’s not good enough. "We are trying to document the quality of life. Even if it is in attainment, it’s still negatively impacting the community," she says. So to help make their case, Andrascik’s group is tapping into an air monitoring project that researchers at Carnegie Mellon University were already working on. At the CREATE Lab, on the Carnegie Mellon campus, they’re developing everything from new electric cars, to robots, to innovative ways to map the air. 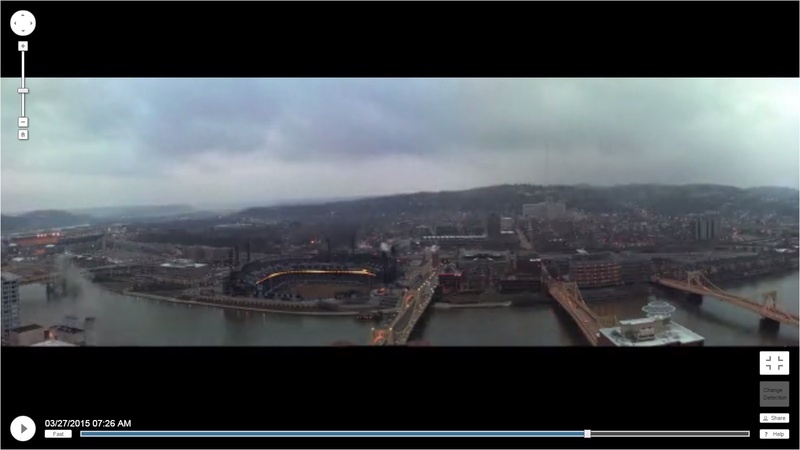 For the past year, Randy Sargent’s been working on something called Breath Cam—which uses time lapse photography to create a visual archive of the air in Pittsburgh. His team has installed four cameras around the city. "These cameras are taking very high resolution photographs. And they’re panoramic photographs," Sargent says. They automatically shoot views of the city every minute, every day of year. Sargent says anyone can go to the Breathe Cam site to play with these time lapse images. .
"If you see something interesting—you see kind of a plume of smoke, and you wonder where did that come from, you can go backwards in time a bit, and you can zoom in and say, 'Oh, that came from this particular source," Sargent explains. Breathe Cam, a Breathe Project venture, debuted last December, and now they’re making improvements. Sargent says they want others to be able to upload their own images to Breathe Cam. This will allow people, like Andrascik, who are frustrated by smells or what they see in their community, to record their experiences. "To the extent that we can make what’s happening more transparent, I think we can get to a better conversation," he says. Sargent’s team is even turning homes into pilot monitoring sites. Amid boxes of Christmas ornaments and rolls of wrapping paper in Leah Andrascik’s attic is a camera, on a tripod. With its extra long lense pointed out one of the window panes, it looks a little out of place—like 007—a stealthy surveillance, hidden in a dusty attic. The camera’s focused on the Shenango Coke Works. It's hooked up to a computer which tells the camera to take a photo every five seconds. Then it uploads them to a server at CMU. "Just to be able to say, “Wow, it really smells terrible, and couple that with looking outside and seeing this big, dark plume of smoke coming from there...it kind of, I guess gives validity to what you’re saying. You know, you’re not crazy," Andrascik says. Andrascik hopes photos like these also will give the Allegheny County Health Department get a fuller picture of what’s going on in her community—and help them better enforce clean air regulations and address violations. 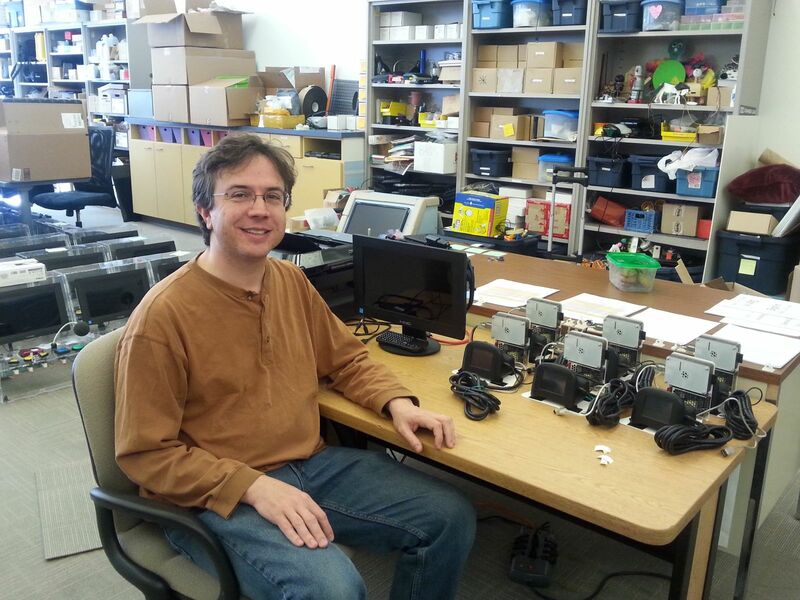 The department’s working with Carnegie Mellon on installing their own camera nearby. But Andrascik says her family may move anyway.She says they’re just fed up with the air, and living here. The Breathe Cam Project mentioned in the story is funded by the Heinz Endowments. The Allegheny Front, is also funded in part by the Heinz Endowments.